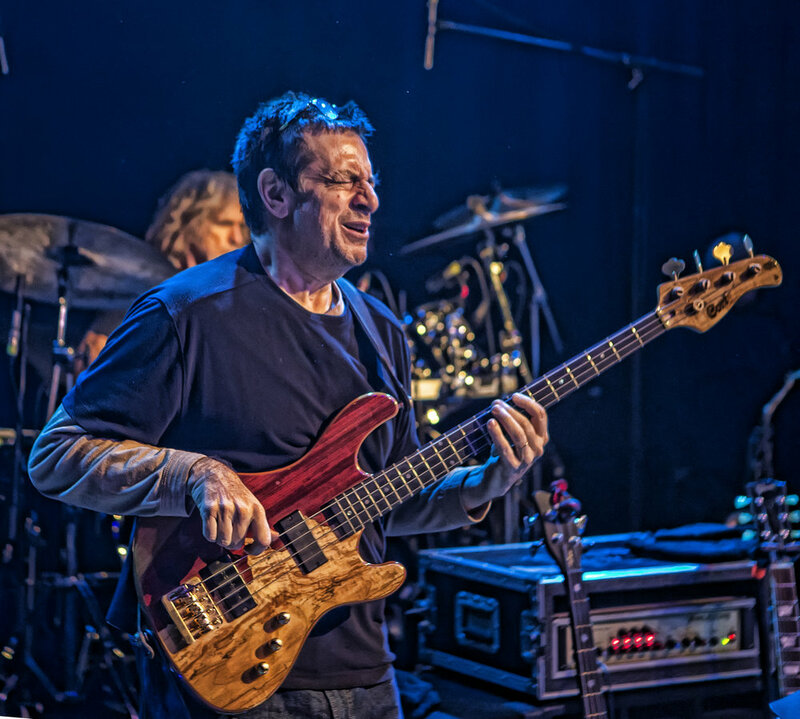 Jeff Berlin is a legend of the electric bass, considered by musicians and critics to be one of the finest electric bass players in the world. Jaco Pastorius regarded Jeff as a better soloist than he was and Geddy Lee referred to Jeff as the “greatest bass player on the planet.” respected critic John Kelman, of All About Jazz, recently referred to Jeff as a “bassist with staggering dexterity, remarkably expansive language and truly funkified spirit.” Because of his prowess, Jeff has performed and/or recorded with such all-star musicians as Bill Bruford, Allan Holdsworth, George Benson, Bill Evans, Allan Holdsworth, Pat Metheny, Frank Zappa, Yes, Rush, John McLaughlin, Gil Evans, Pat Martino, Bill Frisell, and Al DiMeola. Jeff also released six highly acclaimed solo records: Champion, Pump It!, Taking Notes, In Harmony's Way, Lumpy Jazz and Aneurythms - and, in 2018, a newly reimagined version of “Joe Frazier,” titled “Joe Frazier – Round 3,” which he recorded with music luminaries Steve Vai, David Sancious (Peter Gabriel, Sting, Bruce Springsteen), Keith Carlock (Steely Dan), and Tom Hemby. Jeff has also been at the forefront of music education for 30 years. He founded The Players School of Music in Clearwater, Florida, penned a column in Guitar Player and Bass Player magazines that were some of their most read, and now offers a series of self-guided bass education packages through his Jeff Berlin Music Group partnership, which also hosts a popular YouTube channel. Jeff continues to perform all over the world to rave reviews and his playing continues to influence a new generation of bass players. Many have said that they have never heard anyone play with Jeff’s melodic fluidity and his teaching continues to inspire and advance players wishing to know about the language of their art. Jeff is available for session work, touring, and bass clinics. David Sancious came to the music industry as a member of Bruce Springsteens' E Street Band, which was inducted into the Rock and Roll Hall of Fame in 2014. He formed the group TONE in 1974 and recorded several critically acclaimed albums of original compositions, including the Billy Cobham-produced Forest of Feelings (1975), Transformation: Speed of Love (1976) and True Stories (1978). He released Just as I Thought (1979), The Bridge (1981), 9 Piano Improvisations (2000), and Live in The Now (2006) as a solo artist. Performing on keyboards and guitars, and as composer and producer, David has recorded and toured with legendary artists like Bruce Springsteen, Peter Gabriel, Sting, Eric Clapton, Jeff Beck, Seal, Santana, Natalie Merchant, Youssou N’Dour, and Erikah Badu. He’s also done session work with a diverse roster of all-star musicians, including Pink Floyd, Darryl Hall & John Oates, Aretha Franklin, Angelique Kidjo, Vinnie Colaiuta, Bryan Ferry, Patti Labelle, Stanley Clarke, and Larry Graham. He was also a member of the historic “A Gathering of Minds,” which brought together David, Jack Bruce, Allan Holdsworth, Billy Cobham, and Didier Lockwood at the 1982 Montreaux Jazz Festival. David recently joined an all-star cast of musicians for Sting’s 60th birthday bash at New York’s Beacon Theater, where he reunited with Bruce Springsteen and accompanied Lady Gaga, Billy Joel, Stevie Wonder, Herbie Hancock, Rufus Wainwright, Mary J. Blige, and will.i.am to cover Sting’s songs. Peter Gabriel has referred to David as a “musician’s musician.” David thinks of himself as a composer who plays well, rather than a person who is proficient on a given instrument. He describes his music as a mixture of harmony and melody from the jazz and classical traditions, combined with rhythms from the rock and R&B traditions. He also enjoys session work, which presents an opportunity to mix direction and freedom. His attitude toward session work is that he’s there to serve the person who wrote the song and the song itself, but his deep knowledge of music and his extensive composing and playing experience also allow him to help creators realize their visions more fully. David is available to create and perform original compositions as well as for session work and touring. A British rock giant and an acclaimed member of New York's acting community walked into a recording studio...and produced one of 2017's strongest and most compelling albums. This odd couple consists of multi-instrumentalist Ian McDonald, a founding member of both Foreigner and King Crimson, and his songwriting partner, guitarist and lead vocalist Ted Zurkowski, a long-time member of the world-famous Actors Studio. Together, this unlikely new songwriting team conjured the album Bad Old World under the banner of their sophisticated slam-bam guitar rock outfit, Honey West. While it's a modern sound stamped by Ian McDonald's world-class musicianship and production, it also bears an instant familiarity, thanks to a sonic blueprint recalling such Brit-rock titans as The Move, Rockpile, Mott the Hoople, and the Kinks. Honey West is available for bookings.